We report a novel technique for transjugular device closure of a secundum atrial septal defect (ASD) in a 4-year-old, 20 kg child with an interrupted inferior vena cava (IVC) by using a “modified” short sheath. Transesophageal echo confirmed a secundum ASD with a diameter of 16 mm. Securing the wire position in a pulmonary vein was unable to be achieved after brief attempts. We decided to use a “modified” short sheath for device delivery. A 10 French, 11 cm sheath (Cook Medical Inc., Fort Worth, Texas, USA) was bent into a C-shape/half-moon shape and placed under cold saline to fixate the curve [Figure 1]. This sheath was placed in the right internal jugular vein, and the wire and dilator were removed. The sheath was manipulated so that its distal end was placed just across the ASD into the left atrium [Figure 2]a and [Figure 2]b. A 20 mm Amplatzer septal occluder (St. Jude Medical, Inc., St. Paul, Minnesota, USA) was deployed with an excellent result [Figure 3]a and [Figure 3]b.
Transhepatic, transjugular, and femoral  approaches have been reported to close a secundum ASD with an interrupted IVC and azygous continuation. During percutaneous secundum ASD closure in patients with an interrupted IVC, it is sometimes difficult to exchange a wire in a pulmonary vein for a stiff wire, from an internal jugular or femoral venous approach. While we certainly could have placed a wire in a pulmonary vein and performed balloon sizing and ASD closure, we chose to use our “modified” short sheath technique to enable a quicker procedure. We overcame these challenges by making a “C” shaped curve that facilitated the sheath position across the ASD into the left atrium. Keeping the tip of the sheath across the atrial septum into the left atrium is very critical in this technique. Although we manipulated the sheath without a dilator across the ASD, this technique can be employed by advancing the shaped sheath and dilator across a wire into the left atrium if stable wire position has been achieved. Using a short sheath also makes deployment of the device less cumbersome as opposed to utilize a long sheath from the right internal jugular vein. It is important to mention that this technique is not suitable for all patients, as the length of the “modified” short sheath has to be long enough to cross the ASD. Determining as low, a right internal jugular venous puncture as possible would be advantageous in some patients. Finally, this technique can be used in larger patients with long sheaths to help maintain position/angulation and even sheaths that are of an intermediate length (e.g. 35 cm). Operators should be familiar with the technique of shaping catheters/sheaths by exposing them to heat (sterile hot water or a “heat-gun,” which softens the sheath and allows the desired curve to be formed) and then cooling them in saline to fixate the curve. 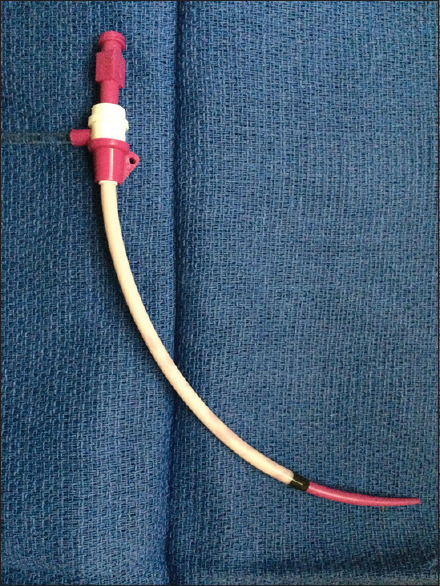 In conclusion, when attempting a transjugular approach for the deployment of an ASD device, our novel “modified” short sheath technique is an alternative way to facilitate such procedures. Oliveira EC, Pauperio HM, Oliveira BM, da Silva RA, Alves FM, Adjuto GL. Percutaneous closure of atrial septal defect using transhepatic puncture. Arq Bras Cardiol 2006;87:193-6. Ozbarlas N, Kiziltas A, Kucukosmanoglu O, Erdem S. Transjugular approach to device closure of atrial septal defect in a child with heterotaxia and interrupted inferior vena cava. Tex Heart Inst J 2012;39:435-7. Lowry AW, Pignatelli RH, Justino H. Percutaneous atrial septal defect closure in a child with interrupted inferior vena cava: Successful femoral venous approach. Catheter Cardiovasc Interv 2011;78:590-3. Mullins CE. Vascular access: Needle, wire, sheath/dilator and catheter introduction. In Cardiac Catheterization in Congenital Heart Disease: Pediatric and Adult. Malden, MA: Blackwell; 2006. p. 100-62.